Today the kids played, and played, and played! they went over to grandmas and played all day in the dirt, yes the dirt. It is amazing how such a simple, dirty, brown ground cover can keep kids occupied for hours!, especially when you add water! I did not have my camera during this play time, and by the time I got ahold of it they were done, sorry next time. 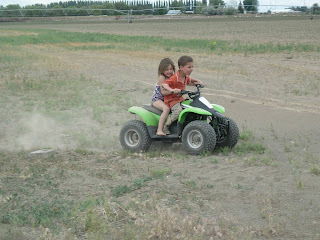 The kids were so cute riding the four wheeler. Ava looks a little nervous, but those two really have a lot of fun! We had a rather productive day today, busy. I got all my flowers planted, got the mulch layed down, finished the herb garden, hit a few garage sales,mowed the lawn( which takes me about 2 and a half hours, yes that long; not because I'm slow, it's a huge lawn!) cleaned the house, signed taylor up for preschool, watched a dog catch and kill a rock chuck( it's like a gofer, but bigger, kinda like my dog.) no i did not see this voluntarily; folded five baskets of laundry, and put them away- yeah for me, went to dinner and the Spanish branch festival, colored my hair, finished a craft, bathed the kids, and posted a blog!!!! whewwww! i should sleep well tonight. 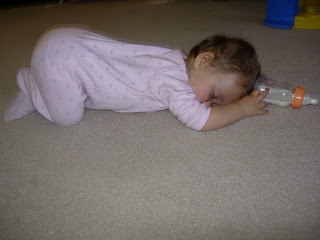 In fact poor little Presley was so tuckered out by the time we got home, she fell asleep on the floor!, too tired to even drink her milk, poor thing. It feels so good to get things done around the house, getting ready to play all summer! How on earth do you get the mud out? If it's set in, how do you get them to only wear play clothes?